As Toronto prepares to welcome its new archbishop, to the north, Ontario's mother see has fallen vacant. Word's come over the wire that, after a lengthy battle with bone cancer, Archbishop Anthony Meagher of Kingston died at 11.20 last night, local time. He was 66. A native of Toronto, where he was ordained an auxiliary in 1997, Meagher was elevated to Kingston in 2002. His two-year fight against the cancer took a downturn in October, when he reported that the effects of the treatment were "becoming more lethal than the cancer itself." Having returned to his family home near Toronto to rest, the archbishop wished to celebrate one last Mass in Kingston, on the solemnity of the Immaculate Conception, the archdiocese's patronal feast. But it wasn't to be. Meagher's passage creates a unique scenario, in which the three metropolitan churches of Canada's largest province will experience a turnover at the top in 2007. 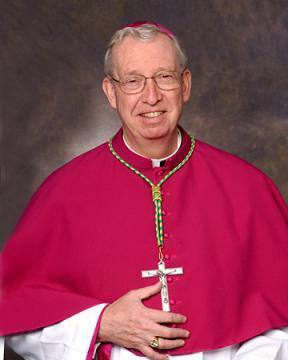 Alongside Archbishop Thomas Collins' arrival in Toronto at month's end, Archbishop Marcel Gervais of Ottawa is anticipating the acceptance of his resignation, for reasons of age, sometime in late June. Home to 116,000 Catholics, the archdiocese of Kingston was founded in 1826. Though small, its significance is derived from its historic distinction as the seat of Anglophone Catholicism in Canada. Over the course of his illness, Meagher communicated with his flock by means of a column called "Letters from a Rocking Chair." After not being able to write for some months, the archbishop mustered the energy to dictate one last note in early December. Way back at the beginning of the cancer, it was suggested to me that perhaps God was allowing me to be sick at this time in order that I might be better able to relate, as Chief Shepherd, to all in our Archdiocese who are not well. I really believe that this is a mission that God has given me, and I am astounded to see how God has been able to use my weakness to touch the hearts of so many people in a positive way. I am about to authenticate this column by moving over to the rocking chair for a few minutes, a task which is now, for me, more easily said than done . . . . I still pray for a miracle, and, from my understanding in talking to the doctors, it would truly be a miracle if I were to recover now, since I am only receiving palliative care and no other treatment. Who knows what will happen when you have all prayed so hard for me; maybe we all need to believe that God can and does work miracles. I wish all of you a wonderful Christmas, and, this year, I guess this will be the only Christmas card I will be sending to you. The letter was signed not with some variation of "Sincerely Yours in Christ," but, simply, "Love."